Last week I took a drive east up the gorge a few miles and stopped at the Womens Forum just in time to see this pretty scene, with the moon rising over Crown Point. A lovely way to end the day! 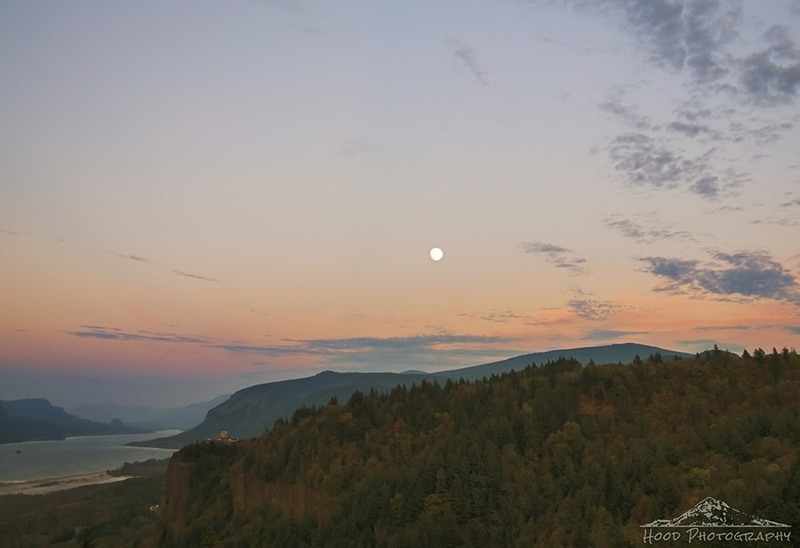 It is a gorgeous view of the gorge and the moon! Happy Skywatching, enjoy your weekend! Lovely indeed. Very nicely captured. Have a blessed week-end. Ah, one of my favorite places and you've captured the beauty perfectly, as always!! Thanks for sharing! Hope you have a wonderful weekend!! Love the trees changing colors, too. Pretty! Yes that is a tranquil scene, beautiful.